If you are looking for a delicious way to cook brown rice, try this wonderful Thai coconut brown rice recipe. In Thailand, coconut rice is often served as a dessert, topped with sliced mango and coconut cream. It is part of dessert dishes such as khao tom mat, khao lam and khao niao kaeo. Coconut rice is also a favorite side dish that works well with a number of different cuisines, including Thai and Indian as well as Western dishes. It is an ideal accompaniment to something spicy as the sweetness will counteract the heat. Rub the oil over the bottom of a regular-sized pot with a tight-fitting lid. Add the rice, coconut milk, water, salt and shredded coconut. Stir and set over high heat. Bring to a bubbling, but not rolling, boil. Immediately reduce heat to low (right above the lowest setting) and cover tightly with a lid. Allow to cook for 1 hour, or until the coconut-water has been absorbed by the rice. When all (or nearly all) of the liquid is gone, turn off the heat, but leave the pot on the burner, covered. Allow the rice to sit for another 5 to 10 minutes, or until you're ready to eat. Your coconut rice will stay warm this way for 1 hour or more (a great make-ahead tip if you're expecting company!). Fluff the rice with chopsticks or a fork, and serve with your choice of entree. 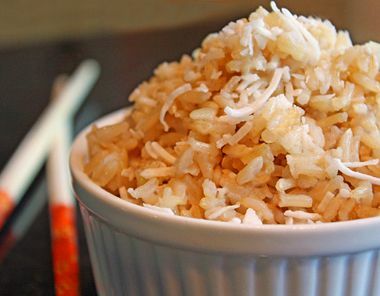 If desired, coconut rice can be topped with a sprinkling of toasted coconut (simply "dry-fry" 1 to 2 tbsp. shredded coconut in a dry frying pan until toasted), or top with a sprinkling of sweetened shredded coconut.